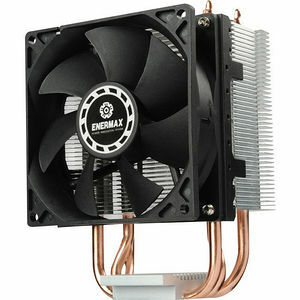 The small ENERMAX ETS-N30-II tower cooler is designed for compact PC systems. It comes with a strong 9cm PWM fan with wide RPM range for best possible adaption to different system requirements. Furthermore, ENERMAX applies the proven air stream techniques Vortex Generator Flow (VGF, patented) and Vacuum Effect Flow (VEF). That way, the ETS-N30II reaches a cooling capacity of up to 150W TDP. Due to the asymmetric heat pipe array and the universal Intel® and AMD® bracket, the small ENERMAX cooler offers best possible RAM compatibility and supports all latest CPU sockets.